The Tandava or celestial dance of Lord Siva is extremely thrilling and charming, exquisitely graceful in pose and rhythm and intensely piercing in effect. Nritya or Tandava is an inseparable, sacred movement of the various limbs of the body in accordance with the inner divine Bhava. Nritya is a divine science. The Adigurus for this celestial Nritya were Lord Siva, Krishna and Mother Kali. In Nritya, the six Bhavas, viz., Srishti, Samhara, Vidya, Avidya, Gati and Agati are demonstrated. The dance of Lord Siva is for the welfare of the world. The object of His dance is to free the souls from the fetters of Maya, from the three bonds of Anava, Karma and Maya. He is not the destroyer but He is the regenerator. He is the Mangala Data and Ananda Data, bestower of auspiciousness and bliss. He is more easily pleased than Lord Hari, He grants boons quickly, for a little Tapas or a little recitation of His five letters. ‘Aghada Bhum’ is His song of dance. When Siva starts His dance Brahma, Vishnu, the Siva Ganas and Kali with Her bowl of skull, join Him. Have you not seen the picture of Pradosha Nritya? It will give you an idea of the dance of Siva. Kali was very proud of Her ability in dancing. Siva started dancing to quell Her pride. He danced very beautifully, very artistically. Kali had to put Her face down in shame. Lord Siva wears a deer in the left upper hand. He has trident in the right lower arm. He has fire and Damaru and Malu, a kind of weapon. He wears five serpents as ornaments. He wears a garland of skulls. He is pressing with His feet the demon Muyalaka, a dwarf holding a cobra. He faces south. Panchakshari itself is His body. Lord Siva says: “Control the five senses which are hissing like serpents. The mind is jumping like a deer. Control the mind. Burn it in the fire of meditation. Strike it down with the Trisula of discrimination. You can attain Me”. This is the philosophical significance of the picture of Lord Siva. You can witness the dance of Siva in the rising waves of the ocean, in the oscillation of the mind, in the movements of the senses and the Pranas, in the rotation of the planets and constellations, in cosmic Pralaya, in epidemics of infectious diseases, in huge inundations and volcanic eruptions, in earthquakes, landslips, lightning and thunder, in huge conflagrations and cyclonic storm. As soon as the Guna Samya Avastha, wherein the three Gunas exist in a state of equilibrium, is disturbed by the will of the Lord, the Gunas manifest and quintuplication of elements takes place. There is vibration of Omkara or Sabda Brahman. There is manifestation of primal energy. This is the dance of Siva. The whole cosmic play or activity or Lila is the dance of Siva. All movements within the cosmos are His dance. He gazes on Prakriti and energises Her. Mind, Prana, matter begin to dance. When He begins to dance, the Sakti Tattva manifests. From Sakti, Nada proceeds and from Nada, Bindu originates. Then the universe of names and forms is projected. The undifferentiated matter, energy and sound become differentiated. The burning grounds are the abodes of Siva. Rudra is the destructive aspect of the Lord. Lord Siva dances in the crematorium with Kali, in His ten-armed form. The Siva Ganas also join with Him in the dance. Nataraja of Chidambaram is the expert dancer. He has four hands. He wears the Ganga and the crescent moon on His matted locks. He holds Damaru in His right hand. He shows Abhaya Mudra to His devotees with His raised left hand. The significance is: “O devotees! Do not be afraid. I shall protect you all.” One left hand holds the fire. The other right hand points down on the Asura Muyalaka who is holding a cobra. He has raised the left foot in a beautiful manner. The sound of the drum invites the individual souls to His feet. It represents Omkara. All the Sanskrit alphabets have come out of the play of the Damaru. Creation arises from Damaru. The hand which shows Abhaya Mudra gives protection. Destruction proceeds from fire. The raised foot indicates Maya or illusion. The hand which points down shows that His feet are the sole refuge of the individual souls. Tiruakshi represents Omkara or Pranava. Chidambaram is a sacred place of pilgrimage in South India. All the Tamil saints have sung hymns in praise of Nataraja. There is Akasa Linga here which indicates that Lord Siva is formless and attributeless. The popular saying goes: “He who dies in Banares with Ramanam in his lips and heart, attains salvation. He who remembers Arunachalam or Tiruvannamalai attains Mukti. He who gets Darsana of Nataraja attains final emancipation.” Real Chidambaram is within the heart. Nataraja dances in the hearts of devotees who have burnt egoism, lust, hatred, pride and jealousy. He dances quite gently. If He dances vehemently the whole earth will sink down at once. He dances with His eyes closed, because the sparks from His eyes will consume the entire universe. The five activities of the Lord, Panchakriyas, viz., Srishti (creation), Sthiti (preservation), Samhara (destruction), Tirobhava (illusion) and Anugraha (grace), are the dances of Siva. 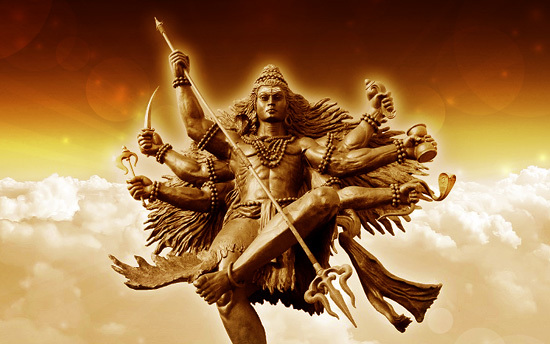 May you all comprehend the true significance of the dance of Siva. May you all dance in ecstasy in tune with Lord Siva and merge in Him and enjoy the Sivananda, the final beatitude of life! Lord Siva is an embodiment of wisdom. He is the Light of lights. He is Paramjyoti or supreme Light. He is self-luminous or Svayam-Jyoti. The dance of Siva represents the rhythm and movement of the world-spirit. At His dance the evil forces and darkness quiver and vanish. In the night of Brahma or during Pralaya, Prakriti is inert, motionless. There is Guna-Samya Avastha. The three Gunas are in a state of equilibrium or poise. She cannot dance till Lord Siva wills it. Lord Siva rises from His profound silence and begins to dance. The undifferentiated sound becomes differentiated through the vibration set up by the movements of His Damaru or drum. Sabda Brahman comes into being. The undifferentiated energy also becomes differentiated. The equipoise in the Gunas becomes disturbed. The three Gunas Sattva, Rajas and Tamas manifest. All the spheres, the atoms and the electrons also dance rhythmically and in an orderly manner. Atoms dance in the molecule and molecules dance in all bodies. Stars dance in time and space. Prakriti also begins to dance about Him as His glory or Vibhuti. The Prana begins to operate on Akasa or subtle matter. Various forms manifest. Hiranyagarbha or the golden egg or the cosmic mind also manifests. 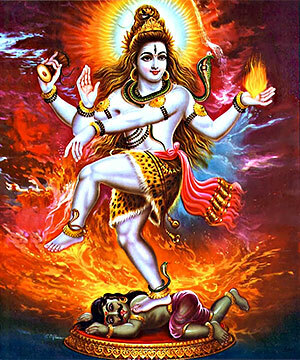 When the time comes, Lord Siva destroys all names and forms by fire while dancing. There is stillness again. This is the symbolism involved in the form of Nataraja. The deer in the hand of Siva represents Asuddha Maya. The axe represents knowledge which destroys ignorance. The drum, the outstretched arm that carries fire, the water (Ganga), the hand with the axe, the foot standing on the Asura Muyalaka, are the formless or Sukshma Panchaksharas. Srishti (creation) is in the drum; Sthiti (preservation) is in the Abhaya hand; Samhara (destruction) is in the hand that holds the axe; Tirobhava (veiling) is in the pressing foot; and Anugraha (blessing) is in the uplifted foot. There are various kinds of dances of Siva. There are the Samhara dance, the five dances, the six dances, the eight dances, the Kodu Kotti dance, the Pandam dance, the Kodu dance. The Kodu Kotti is the dance after the destruction of everything. Pandam is the dance after the destruction of the three cities, wearing the ashes of those cities. Kodu or Kapalam is the dance holding Brahma’s head in the hand. Samhara is the dance at the time of dissolution or Pralaya. Srishti, Sthiti, Samhara, Tirobhava and Anugraha, and also Muni-Tandava, Anavarata Tandava and Ananda Tandava constitute the eight dances. Sivananda dance, Sundara dance, the golden city dance, the golden Chidambaram dance and the wonderful dance form the five dances. The five previous dances and the Ananda dance in the end form the six dances. Lord Siva is the only dancer. He is the Master or expert dancer. He is the King of dancers. He quelled the pride of Kali. Lord Siva’s destruction is not a single act, but is a series of acts. There is a different kind of dance at every stage.